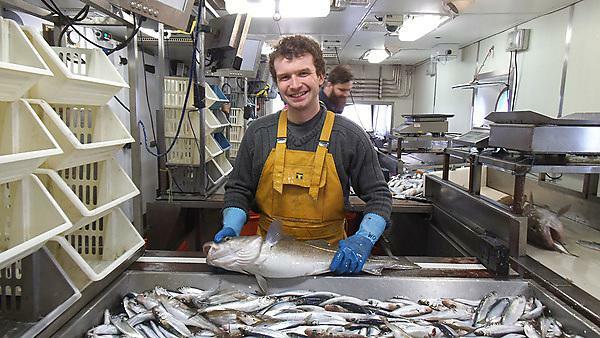 By the end of my undergraduate degree I had decided that I wanted to do a masters, so I went on to Aberdeen to study for an MSc in Fisheries Ecology. I did that for a year and have ended up at Marine Scotland Science (MSS) doing a maternity leave cover contract in their Inshore Fisheries team. Easily offshore fieldwork with MSS. So far, I have been on three fisheries surveys. Essentially, these are about getting a handle on the relative abundance of fish in a stock. For example, the first one targeted haddock at the Rockall Bank in the Atlantic. You see a lot of interesting species and I enjoy the team work, despite getting sea sick. I would probably do more volunteering relevant to my current work; for example more boat work at sea and also more volunteering relating to taxonomy and identification of subtidal invertebrates. From a philosophical point of view, I think it’s important for biologists to have good natural history skills. The main reason I decided to study at Plymouth was the course reputation, but also the HSE SCUBA course. Ironically, I did not end up doing the HSE course, but the modules prior to it, such as survival at sea, have been invaluable for joining the surveys at MSS. Chiefly, the library – which I definitely spent too much time in. I only realised when I started studying at Aberdeen how good the Plymouth library was for getting interlibrary loans, etc. The Disability service was also great: they sorted out my test for dyslexia. I think volunteering on research projects and doing a studentship with a Genetics Society grant was probably most important to my change of career. Having that experience of what academic research is like was fantastic; it also showed me my real interest which is in directly applied aspects of the discipline. Probably the field trip to Portugal: partly for the weather, as it’s pretty rare to be doing science in the blistering sun. But in all seriousness the group research projects were great and it’s amazing how much you can learn in a week. I think Plymouth gave me a really good grounding in persevering with work and research. This has been, and will be, important in overcoming challenges. Easily the extra-curricular opportunities which are available. The staff are really happy for students to help out on their research projects and there is a really great diversity of research which goes on: anything from developmental biology to conservation science relating to Marine Protected Areas.